We offer high end work at competitive pricing. Full service design build including Interior Design and Architectural plans we are 4 time best of Houzz winners and A plus BBB rated! You can count on Mathis Custom Remodeling for quality Room Additions, Whole House Renovations as well as helping you every step of the way in creating Your Dream Kitchen or Bath. Phillip and Raelene Mathis have been in business providing clients with excellent service at great value for over 25 years. We believe in treating you the way we would want to be treated, and ensure that your remodeling project is everything you had envisioned. 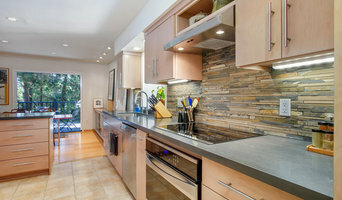 Located in the heart of San Diego, Studio Studio Stratton offers complete kitchen design services to California’s most discriminating home owners. Our commitment to creative and functional design springs from over 30 years experience right here in San Diego. The sampling here should leave you with the accurate impression that we are more than capable of rendering a design that is uniquely yours. Contact us for a complimentary design consultation. We feature cabinetry by William Ohs, Plato Woodwork, and NatureKast. Having started her career in marketing with a major nationwide architectural firm, Hedy gained an early appreciation for good design in combination with optimal use of available real estate. Now a space planner, NKBA-certified designer and licensed broker with the State of California, Department of Real Estate, Hedy’s diverse background brings an overall vision to projects, providing a distinct advantage for her clients — including homeowners, investors seeking to maximize returns, and building trade professionals recognizing the value of added specialized expertise. UNIQ Kitchen and Bath Designs specializes in creating functional, stylish kitchen and bath designs that meet your family's living space needs, your budget and even your personality! Our goal is to help you every step of the way from Design to Material to Project bids to implementation and follow through to completion. Never leaving you stranded or feeling like you’re trying to take on this project all by yourself. We are here for you every step of the way. What does a Bostonia kitchen designer or bathroom designer do? A kitchen and bath design professional in Bostonia, CA knows to take all of these crucial points into consideration and can help plan the layout, materials and overall look and feel of either of these rooms in your home. Kitchen designers, as well as bathroom designers, are constantly staying on top of trends in the ever-changing industry. The designer also knows the best layout for your room, and can configure the layout for optimal functionality and utilization of the space. In the kitchen the refrigerator, stove and sink should be laid out in relation to one another, and it should be seamless and easy to move from one to the other. A Bostonia kitchen and bath designer will know how to work with a contractor and architect to plan the flow of the room to work best for your needs. Here are some related professionals and vendors to complement the work of kitchen & bath designers: Kitchen & Bath Fixtures, Appliances, Tile, Stone & Countertops, Cabinets & Cabinetry, Woodworkers & Carpenters. Before you talk to bath and kitchen designers in Bostonia, CA, consider how you will use the room. For your bathroom, is it necessary to have a bathtub for bathing kids or pets, or would a shower suffice? Perhaps all you need is a half bath for downstairs or a smaller guest bath for occasional use. Similarly, for kitchen renovations consider your cooking habits. Do you eat out every night but need a space to entertain in? If so, a smaller kitchen might be fine for you, with a space devoted to wine storage or a bar, whereas others might prefer a bigger stove or extra cabinets. When interviewing Bostonia kitchen and bath designers, make sure to share these habits so they can best fit the room to suit your needs. Find a Bostonia kitchen designer or bathroom designer on Houzz. Narrow your search in the Professionals section of the website to Bostonia, CA kitchen and bath designers. You can also look through photos in Bostonia, CA to find a kitchen or bathroom you like, then contact the professional who designed it.